What I tried with Dr. Sophie Menkes, is not what I do everyday. The mesolift basically consists of injecting vitamins, minerals and hyaluronic acid with a needle 2 mm under the skin, just before your blood vessel so it stays a pretty light operation and more importantly, it doesn't hurt. My eyes still watered but I blame it on the highly sensitive skin I have. After needling my face, I could (sincerely) notice the cushion-y skin it gave me. I felt like I slept one week. Normally, it takes up to three sessions to have durable effects. My next session will be at the Forever Boutique in Lausanne, where the mood is slightly different. From across the street, Rue Caroline 5, you can see big two beautiful glass windows that looks inside of the bright and clean decorated institute. As you enter, you directly notice a white bar serving fresh fruits infused water and that's where you take an appointment and discuss your needs.. or your day. I was personally welcomed with macaroons and big smiles from the team. Behind the bar, there is a wall of Alchimie Forever products, which is a skincare line created throughout the years of practice of Dr. Polla purposely to answer a need for the skin and as a complement to the different treatments made in both institutes. 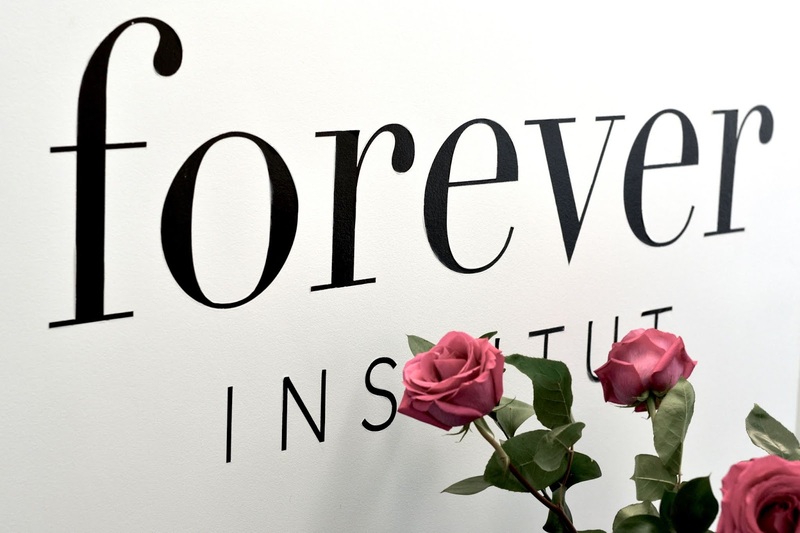 At Forever Boutique - Lausanne there are two floors: the first one with a lounge mood and a beautiful refined decoration and the 2nd one down which is more a clinical part with cosmetic seats, a room with laser and tatoo remover machines. I sat for my 2nd mesotherapy session and my eyes didn't have to look weirdly around the doctor as I had a big screen in front of me: showing Miami's soothing beach waves. Same products and rituals as my first mesotherapy session but this time, after the needle session, the delicate Dr. Véronique Bani massaged onto my face a mask that doesn't have to be removed as your skin absorbs it almost right away. Ask for the Kantic Brightening Moisture Mask: I actually felt like I received a Miami's beaches wave on my face. After that, Aïcha pampered me with Chado and Ellis Faas make-up and I was ready to start my day, fresh and clean. I sincerely recommend this place, not only for the professionalism and the quality of the products and treatments but also, and this is one of the most important thing in the beauty sector: the hospitality, the good vibes, good gestures and the sincerity behind their goals of making you feel and be more beautiful. Thank you Polla's sisters and each member of the team, I'm surely coming back again soon.